a vertical nystagmus with a rapid component downward, occurring in lesions of the lower part of the brainstem or cerebellum. A regular, repetitive, involuntary movement of the eye whose direction, amplitude and frequency are variable. Nystagmus can be induced, acquired or congenital. (In a very small percentage of people it can even be induced voluntarily.) These eye movements typically appear as one of two types: pendular nystagmus or jerk nystagmus (Fig. N3). Jerk nystagmus is one in which there is a slow and fast phase, the nystagmus being conventionally defined by the direction of the fast phase. A feature of jerk nystagmus is the null zone (or null point) which represents the direction of gaze at which the nystagmus has the smallest amplitude. A jerk nystagmus is usually due to a motor defect that may be induced by brainstem or cerebellar lesions, drug intoxication (upbeat nystagmus in which the fast phase is in the upward direction or downbeat nystagmus in which the fast phase is downward); associated with a lesion of the central nervous system or the vestibular nerve or nuclei (central nystagmus and vestibular nystagmus); or to disease or injury to the labyrinth (labyrinth nystagmus); or to multiple sclerosis. Jerk nystagmus can also be induced physiologically, as for example optokinetic nystagmus (OKN) or train nystagmus, which occurs when watching objects that traverse the visual field rapidly, or as a result of thermal stimulation of the labyrinth of the inner ear by cold or hot water (caloric nystagmus or Barany's nystagmus), or when the eyes of a fatigued person are turned into an extreme position of gaze (end-point nystagmus), or when a person who had been spinning round is stopped (vestibular nystagmus).The other type is a nystagmus which is characterized by movements of equal velocity in each direction, the pendular nystagmus. A pendular nystagmus usually occurs as a result of poor central vision (sensory deprivation nystagmus) as in bilateral chorioretinitis, total colour blindness, albinism, congenital cataract, corneal scarring, amblyopia (amblyopic nystagmus) or in coal miners after many years of working in the dark (miner's nystagmus). In some cases one eye rotates upward and intorts while the other rotates downward, and extorts (see-saw nystagmus as a result of brainstem stroke, chiasmal lesion or multiple sclerosis). 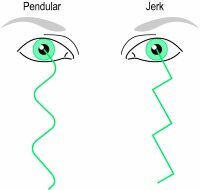 In some cases there is a mixture of the two main types; pendular in the primary position and jerk on lateral gaze (mixed nystagmus). The movements of the eyes are usually the same in both eyes (conjugate nystagmus) but in other cases they may be unrelated as a result of internuclear ophthalmoplegia (dissociated nystagmus). Examples of the latter are end-gaze nystagmus, convergence-retraction nystagmus and see-saw nystagmus. Or the eye movements are of equal amplitude and type but in opposite or different directions (disjunctive nystagmus), also commonly associated with internuclear ophthalmoplegia. There are also cases of unknown origin (idiopathic nystagmus). See hereditary spinal ataxia; Wernicke's disease; foveation period; Alexander's law; monochromat; internuclear ophthalmoplegia; oscillopsia; yoke prisms; Faden procedure; vestibulo-ocular reflex; spasmus nutans; Down's syndrome; optokinetic nystagmus test. nystagmus blockage syndrome See nystagmus blockage syndrome. caloric nystagmus See caloric testing. congenital nystagmus A motor nystagmus that is present at birth or soon after. It may be inherited as X-linked recessive or autosomal dominant, or induced in the uterus, and results from decreased vision due to corneal opacity, cataract, albinism, aniridia, macular disease or optic atrophy. It is typically a horizontal jerk nystagmus and it may be associated with abnormal head movement and decreases in intensity with convergence. The visual prognosis is reasonably good, but if the head turn is excessive, extraocular muscle surgery may be needed. See spasmus nutans. convergence-retraction nystagmus A jerk nystagmus which appears on attempted upward gaze and in which the fast phase brings the two eyes towards each other in a convergent movement with retraction of the globes into the orbit. It may result from a lesion affecting the tectum or dorsal midbrain or a pineal tumour, or form part of Parinaud's syndrome. See pinealoma. gaze-evoked nystagmus An acquired form of horizontal nystagmus characterized by a jerk nystagmus on eccentric gaze with the fast phase towards the direction of gaze. This type of nystagmus is believed to be due to cerebellar or brainstem disease affecting the conjugate gaze centres. occlusion nystagmus A form of nystagmus occurring when one eye is covered, or which increases in intensity when one eye is covered. The nystagmus is typically of the horizontal, jerk variety, with the fast phase occurring in the direction of the occluded eye. physiological nystagmus See fixation movements. rotary nystagmus A very rare form of nystagmus in which the eyeball makes a movement about the visual axis. It may result from a lesion to the vestibular nerve. See vestibular nystagmus. sensory nystagmus A form of nystagmus thought to be due to an abnormality in the afferent mechanism. It is most often due to inadequate image stimulation of the macula, leading to abnormal development of the ocular fixation reflex. Causes include congenital cataracts, optic nerve hypoplasia, aniridia, albinism, achromatopsia, as well as Leber's congenital amaurosis. vestibular nystagmus There are two main types of vestibular nystagmus: Peripheral vestibular nystagmus results from stimulation, injury or disease (e.g. Menière's disease) of the labyrinth or of the vestibulo-cochlear nerve (VIII). It presents as a jerk, mainly horizontal, nystagmus with a torsional component. It may be accompanied by vertigo, tinnitus and hearing loss. Fixation inhibits the nystagmus. Central vestibular nystagmus results from stimulation, injury, disease of the central vestibular pathways of the brainstem or the cerebellum, or lesion of the vestibular nuclei. It is typically a jerk nystagmus, which can be purely horizontal, vertical or torsional. It is not inhibited by fixation.